On Friday after work, B and I decided that we were going to stop for an app and a beverage on the way home. We were trying to think of a place to go, and just ended up at our favorite Mexican joint: Tecate in Vestavia Hills. Sheffield ate so many chips and dip (he looooves salsa, guacamole and cheese dip), and he was so well-behaved. I think we have finally started to be able to take him out in public, and it not be a giant production. I mean, look at these two goobs – my faves. Saturday morning, we met up with the daycare mom (!!!) and her family for Big Machines Day at McWane! They had a ton of cranes and construction equipment as well as a firetruck, which was apparently the hit of the day. The kids were actually able to get in the machines and push buttons. 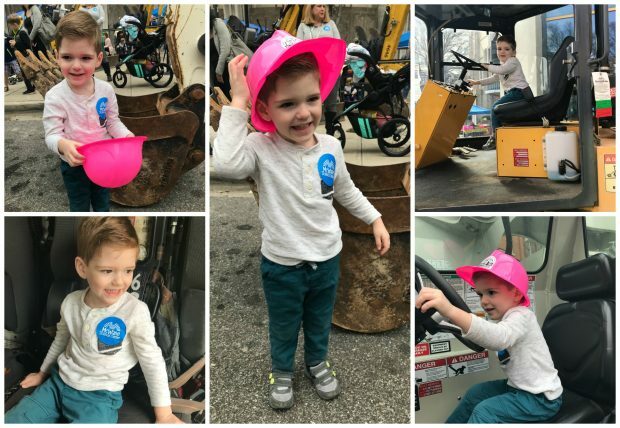 They were offered a yellow or pink hard hat, and of course my kid picks the pink hat – so proud. We played around at Itty Bitty Magic City, and then went over to Pizitz Food Hall for lunch. Boogs actually ate his chips and grilled cheese (WHAT?!? ), and I got a delicious poke from Ono Poke. B also got an amazing shrimp bahn mi from Mo:Mo. It was so fun getting to hang out with another family! I see lots more adventures in our future! Sunday, B had a craving for some IHOP, so why the hell not? 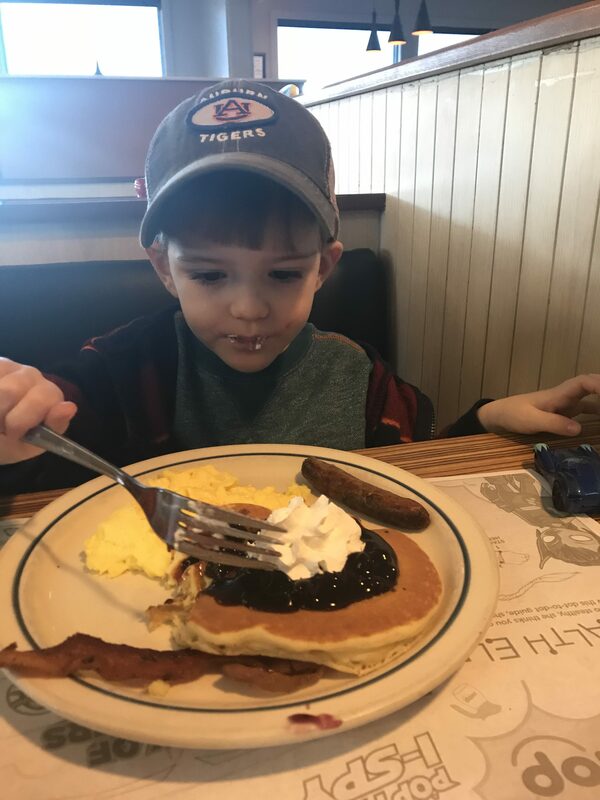 We took boogs for his first taste of IHOP pancakes – he chose a blueberry topping, and ate all of the whipped cream first. He was in breakfast heaven. We spent the rest of Sunday playing outside, painting and watching, what else, PJ Masks. I even found a $4 PJ Masks pillowcase at Target and made his little weekend. 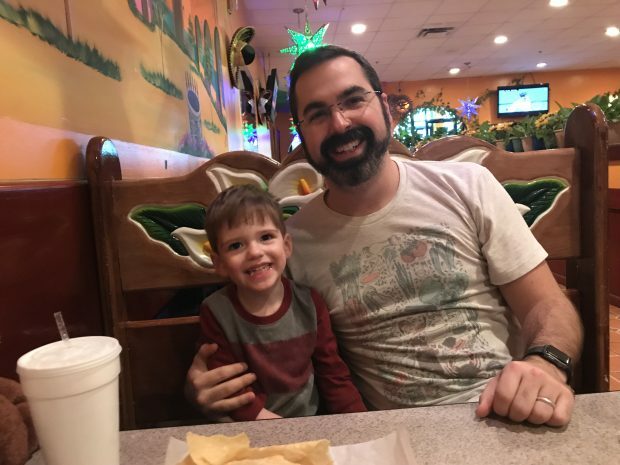 Every weekend with that little guy seems to be getting better and better – he is definitely a lot of fun to hang out with. I love love love these weekends with my two guys – they just seem to recharge me, and make me feel really really good. I hope y’all had a great weekend as well and a good start to the week!! Abel is only a few months younger than Sheffield but I don’t think we’re anywhere near going out to eat in restaurants… Sigh. He does also like the color pink and it makes me feel like such a cool & great mom raising this gender-unbiased kid, Haha.